In Defense Of Food Stamps: Why The White House Sings SNAP's Praises : The Salt Republicans in Congress want to cut SNAP funding by 20 percent and transform the program. But proponents, including economists in the White House, say it keeps millions of families out of poverty. 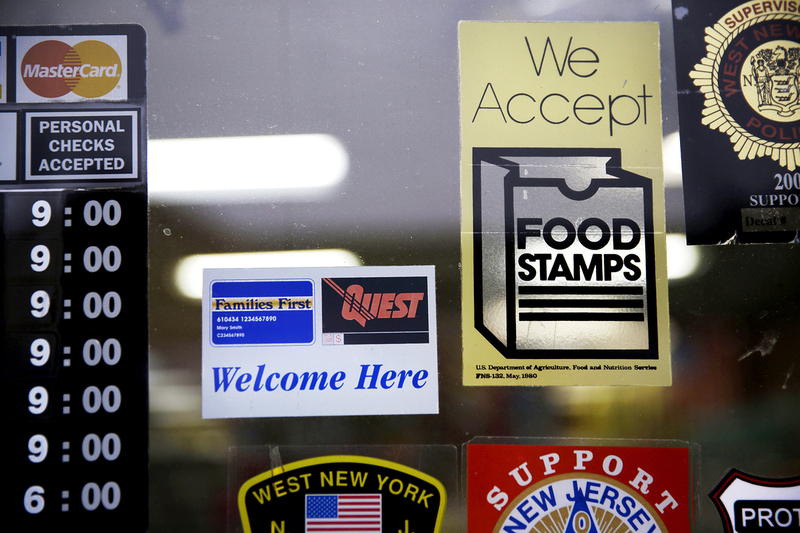 A supermarket displays stickers indicating it accepts food stamps in West New York, N.J., in January 2015. Among the programs in Ryan's sights is the Supplemental Nutrition Assistance Program, the federal government program also known as food stamps. But a few days after his speech, the White House came to SNAP's defense. The Council of Economic Advisers published a report painting a picture of an effective, albeit limited, program that feeds the hungry and thwarts poverty. "New research has come out that is really compelling," says co-author and CEA member Sandra Black. "We think it is important to show that both the benefits of this program are huge and it's insufficient as it is." Today 46.5 million Americans get SNAP benefits — on average about $125 a month per person to buy food from authorized retailers. The CEA report finds SNAP is best at doing what it's intended to do: keep people from going hungry. But it also reduces poverty overall. According to the authors, in 2014 the program kept close to 5 million people out of poverty, 2 million of them kids. Children whose parents are in the program start to reap benefits before birth, the report notes. Access to SNAP increased birth weight and reduced neonatal mortality; later in life it was linked to a reduced incidence of obesity and diabetes, a higher IQ, better education and higher income. For adults, the program can free up money for preventive medical care. One study found participants have more medical checkups compared with low-income people who didn't receive benefits. Despite the positive impacts, the CEA says the benefits don't last through the month. When they run out, studies show, hospitalizations for hypoglycemia spike while kids' test scores drop off. The report comes as budget proposals by Ryan and others have sought to cut the $73 billion program by 20 percent and transform it. Currently, it's an entitlement program with a flexible spending model that extends benefits to anyone who's eligible. The proposal is to change it to a block grant, which fixes funding and limits enrollment. Meanwhile, the House Agriculture Committee has hosted a series of hearings on SNAP as part of a full review. Next year, around a million people stand to lose benefits as provisions that kicked in during the recession expire. Calls to reform SNAP have grown louder since rolls ballooned during the recession. Rates of food insecurity and SNAP participation haven't dropped to pre-recession rates, and politicians like Ryan say they are sick of the program's big price tag. Proponents argue that the spike in participation just means the program is actually doing its job and responding to economic instability. Some 70 percent of SNAP users are in families with children; most participants are white, though African-Americans and Latinos are disproportionately represented, and many are employed. "SNAP is associated with lots of working poor, more than it used to be," says Elaine Waxman, a food assistance expert with the Urban Institute. "That reflects the struggle people have to live on the available hours and wages." While battles over the scope of the program aren't new, SNAP has generally enjoyed broad support. But there's real concern in some corners that it's dissipating. "I would not underestimate the potential threat that the program is under politically at this point," says James Ziliak, director of the nonpartisan Center for Poverty Research at the University of Kentucky and editor of a new book titled SNAP Matters: How Food Stamps Affect Health and Well-Being. Last year, as Congress wrangled over a new farm bill, which funds the program, the House pushed to cut $40 billion from SNAP and severely limited eligibility (the compromise bill will cut $8 billion over 10 years). The debate was acrimonious. When the farm bill is up for reauthorization in 2018, it may only get more heated. Luke Tate, a senior policy adviser on the White House Domestic Policy Council, blames the waning support in part on a lack of information. "The pattern that we have seen over the past couple of years of losing the strong bipartisan support for both the efficacy of this program and the general principle that we shouldn't be letting American families go hungry is troubling," he says, especially given the evidence. Still, not all research shows SNAP is successful. "There are some mixed results," Ziliak says, "especially when it comes to obesity." Obesity rates are known to be high among SNAP recipients, but the program's role in that is difficult to tease out, and there are few good studies. Overall, though, Ziliak says, the most rigorous research available suggests SNAP has a positive impact on families. What we now call SNAP grew out of farm support programs put in place during the Great Depression. When crop prices plummeted in the early 1930s, the government stepped in to help farmers by buying commodities, then distributed those goods to hungry families through relief agencies. Today the program can still be seen as a boon to farmers — and to communities generally. The USDA estimates that every dollar in SNAP spending generates $1.79 in economic activity. "People think of it as a drain," says the Urban Institute's Waxman, "but it's an economic generator." A booming economy might lower the number of people in the program, but for the two-thirds of SNAP participants who don't work — children, the elderly and the disabled — it wouldn't make a difference. And, rolling it back could result in costs that would outweigh any savings. "Basically," Ziliak says, "penny wise, pound foolish." A previous version of this story misstated the cost of SNAP as $74 million. In fact, it's $74 billion.